The Prime Minister, Shri Narendra Modi arrives at Brisbane, Australia for G20 summit on November 14, 2014. Brisbane : PM Narendra Modi on Friday arrived in Brisbane on the second leg of his three-nation tour during which he will attend the annual G20 summit and hold bilateral talks with his Australian counterpart Tony Abbott. 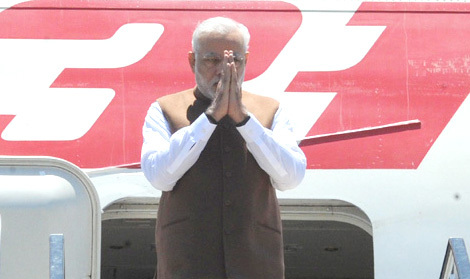 Modi reached Brisbane after attending the ASEAN-India summit and the East Asia Summit on November 12-13 in the Myanmarese capital Nay Pyi Taw. The Prime Minister is on a 10-day visit of Myanmar, Australia and Fiji to attend key multilateral summits and undertake bilateral meetings. Before his departure from India, Modi had said the importance of global cooperation against black money will be a key issue he will highlight at the G20 summit. “A key issue for me would be to highlight the importance of international cooperation against black money,” Modi had said in a pre-departure statement. As India attempts to unearth black money stashed abroad, Modi is expected to renew the country’s commitment to a global response to deal with cross border tax avoidance and evasion. At the annual summit of the Group of 20 of the world’s biggest developed and emerging economies, Modi had said he intends to discuss how it can accelerate creation of next generation infrastructure, which also includes digital infrastructure, and ensure access to clean and affordable energy. The two-day summit will be held from 15th November. G20 accounts for 85 percent of the world’s economic output. During his visit, Modi will also hold talks with Prime Minister Abbott in Canberra after the G20 summit.Modi is the first Indian Prime Minister to visit Australia in 28 years since Rajiv Gandhi in 1986. “While we have much in common with Australia, our political, strategic and economic relations have been below potential. “A closer strategic partnership with Australia will support India’s economic goals; promote our security interests, including maritime security; and, reinforce our efforts to foster a climate of peace and stability in our extended continental and maritime neighbourhood,” he said referring to his four-city Australia visit that covers Brisbane, Melbourne and Sydney besides Canberra.